This summer I took a good long break from mural projects. I had other adventures, including a road trip through the northwest with my son (he did most of the driving) and spending a week hiking in Telluride, Colorado. Even though I only went to one museum this summer, the booming popularity in murals, and public art in general, meant I still saw plenty of great art. Some of the pieces I encountered inspired me to stretch my creative efforts in new directions. Here are a few highlights from my serendipitous encounters art this summer. 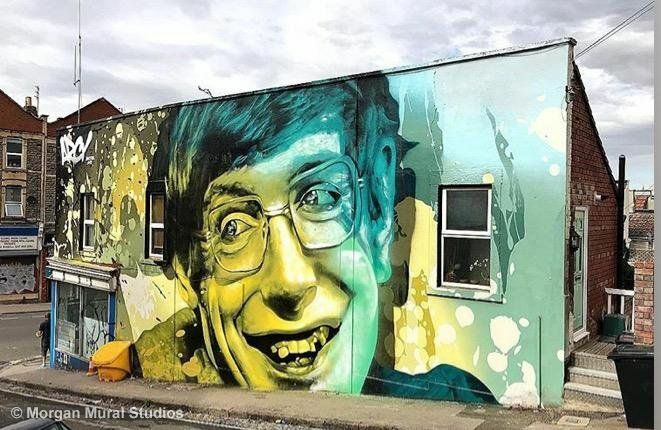 The storytelling, visual impact and execution of this mural are all incredibly well done. It is both beautiful and uniquely Oakland. The first stop on the road trip with my son was Portland. 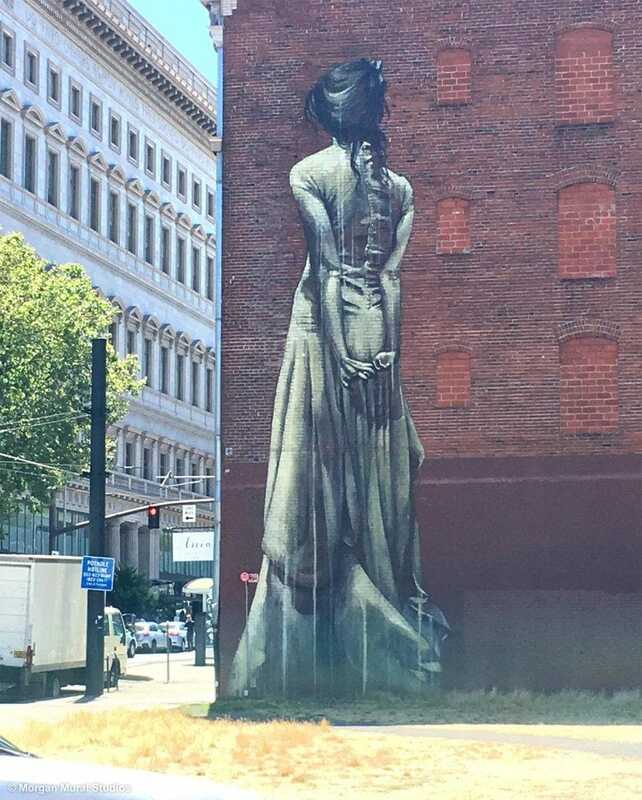 I discovered this mural across the street from Powell’s bookstore. It was unsigned, but I recognized the artist right away. Faith XLVII is my favorite public mural artist. 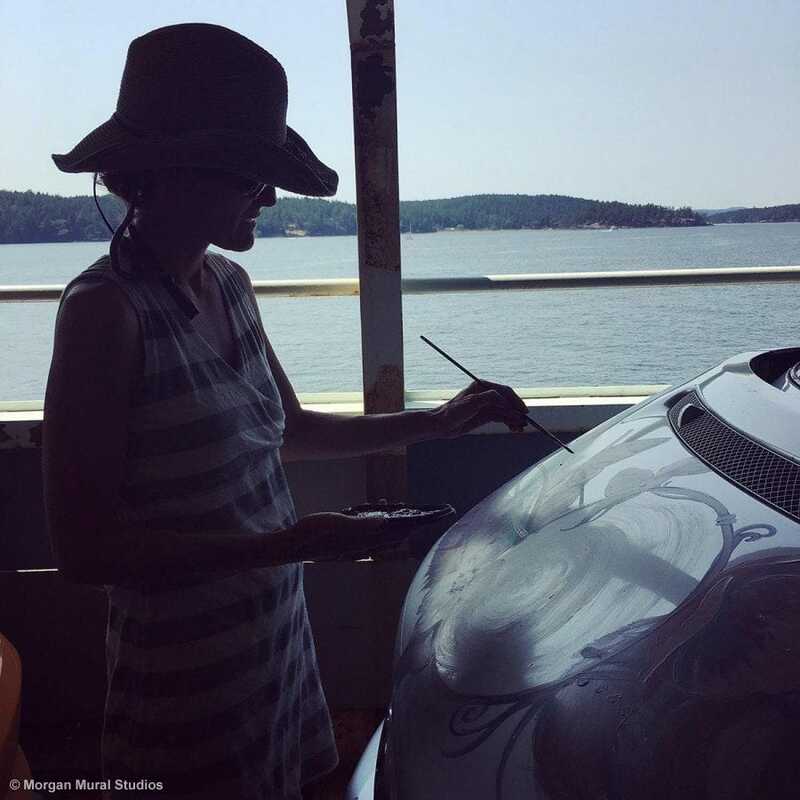 She uses greytoned colors, a charcoal and cream color palette with washes of layered paint. Her draftsmanship is always superb. But what I love most about her work is the distinctly feminine feel of the imagery, which is enhanced by the heavy, masculine architecture of the buildings she typically paints on. 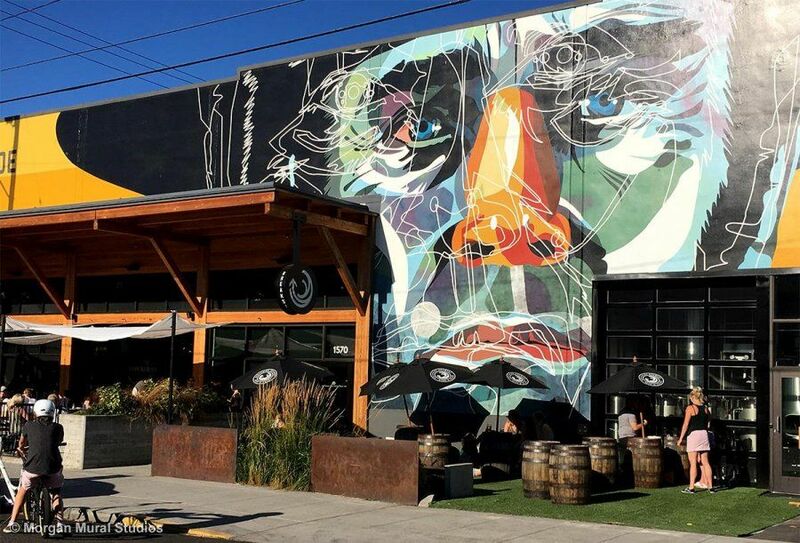 I saw this mural at Burnside Brewing in Portland. I love the illustrative shapes, the line element, and the modern feel. It reminds me of another mural I love by Arcy, also graphic in nature. The shapes, color, shadow and feel of the background of this piece give it a room enough to feel intuitive and surreal while still feeling clean and modern. Vancouver was a highlight of our trip. We had our bikes with us, and the bike path system made seeing the whole city a breeze. I’ve never visited a place where good city planning was more evident. 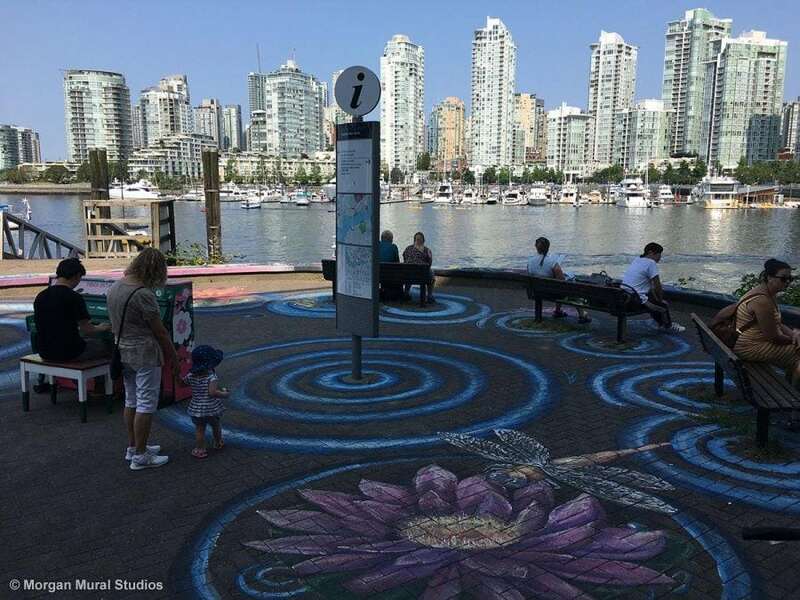 It was a beautiful Saturday morning and we were on our way to Granville Island public market when the bike path opened up to this sweet scene with a painted public piano (with a talented musician playing it), colorful street painting by Emily Gray, and a row of Adirondack chairs as well as benches from which to take in the view of the city. Wow. For a moment, imagine this scene another way: take away the artwork on the ground, the painted piano, the Adirondack chairs. Imagine how different this space would be. How much money do you think the city spent on those three items? And consider the value this activated plaza adds to the community and the tourists who are left with a lasting impression. This is what I am talking about, folks. To me, great art is not about the who and the what, it is about the where and the why. Good public art transforms the whole experience of place. This sculpture, “Non-sign II”, sits at the Canadian/US border. I am taken with how something metal and spikey can leave such a soft, surreal impression. What an interesting piece to have at a bureaucratic processing junction. Lots of directional and informational signs abound. Have your passport ready. Do not exit your car. Declare the following items. And then this, “non-sign”. It is wonderfully site-specific. 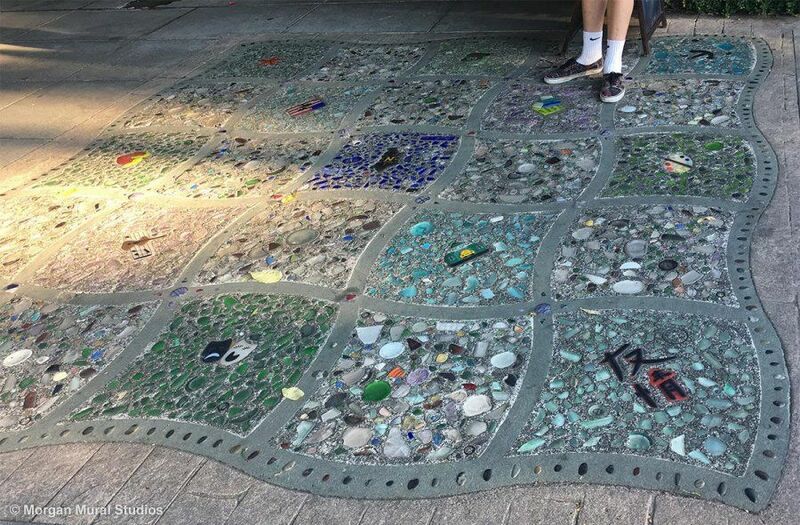 Totally different, yet still completely aligned with it’s enviornment, is this “welcome mat” mosaic on Bainbridge Island, Washington. It is made primarily from glass and stones picked up on the beaches around the island. Each square of the artwork celebrates an aspect of the community. Coming across this piece reminded me that an item on my bucket list is to learn to paint and fire tiles, so I can create mural mosaics. I love the bold color, ease, and fluidity of paint, but the longevity and durability of working with tile stone and glass materials is appealing. My hand started twitching from all the inspiration I enountered during the trip. While waiting in the ferry line on Orcas Island in the San Juan Islands, WA, I started painting the largest canvas I had on hand: my van. My van has needed a new paint job for a while. Was I really going to spend thousands of dollars to repaint it silver? 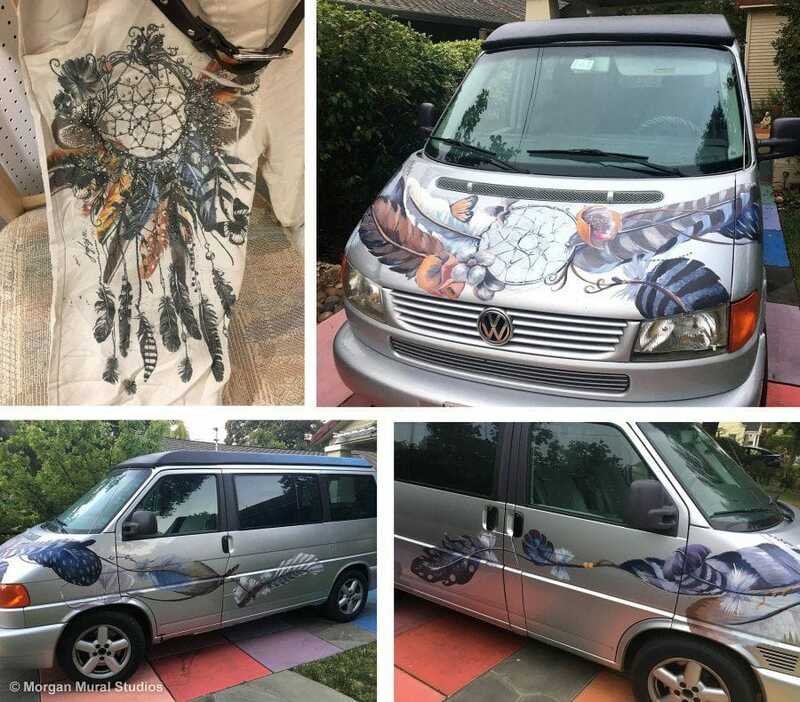 The inspiration for the design on my van came to me during a day off a few months back. I was poking around Sausalito with my BFF when I spotted a pair of pants with a print of a dream catcher. I wasn’t looking for anything in particular, which, of course, is when inspiration is most likely to visit. I am not sure why I would see a pair of pants and think ,”that would look great on my van”, but I’ve learned life gets more interesting when I listen to my hunches. I consider the van painting more like an ongoing knitting project that I can pick up anytime; it is certainly not yet finished. There are still dings that need to be masked with paint – I mean art. Also, the “inspiration pants” have rhinestones. My van is whispering to me that she could use a little bling. After the road trip I headed to Telluride, CO where I met up with four friends I met 25 years ago when I lived in Granada, Spain. It was a dreamy week traversing the incredible natural beauty of Telluride and reconnecting with some of my favorite people on the planet. I was inspired to leave a thank you gift behind on the walls of my friend’s house in Telluride. 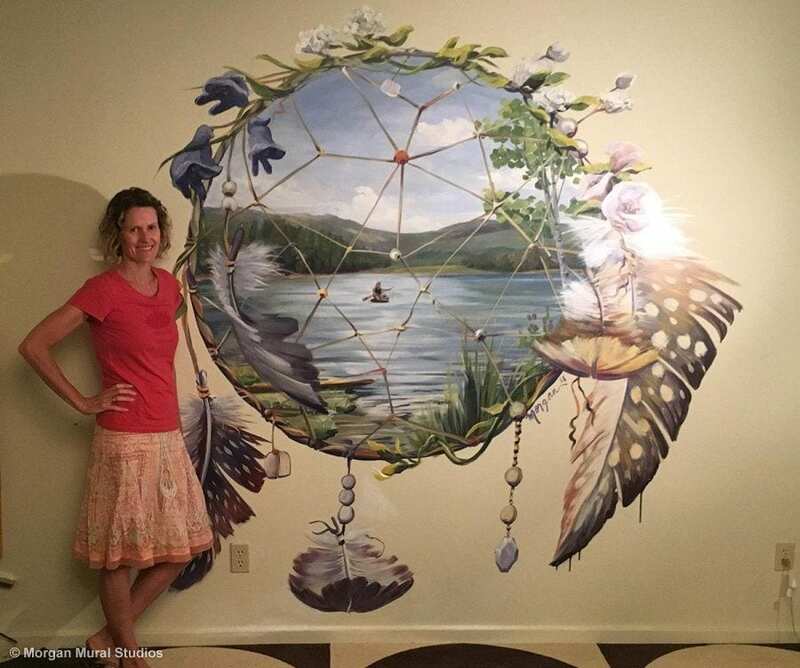 I combined the dream catcher motif that I had been thinking about with a landscape from our day of paddle boarding and hiking around an alpine lake. It was a dream, and it was caught, at least in paint. I came home from my summer adventures absolutely more inspired for my own work. Labor Day is a great day to celebrate and remember that it is when we are at play, not work, that our best ideas come to us. I believe that taking time off to rest and putter and hike and follow hunches is ironically one of the most “productive” things we can do.